I’m on three arts committees this year, and Sam is President of the Sunshine Coast Theatre Alliance so I sit in on the Sunshine Coast Theatre Festival committee meetings. We confer with local councils and sub-committees to support community events, and once (and only once) I went to a P&C meeting. You’ve gotta’ laugh, haven’t you? And in the end, you’ve just gotta get things done! If you’ve ever been on a committee you’ll love this play. Here’s an extract, which totes sums up the tone of the show. Brian: Item six. The sausage sizzle. Brian: Councillor McInnes has a few queries. Wally: Now there’s a surprise. Helen: I was just thinking that a sausage sizzle is a bit monocultural. Helen: Are we reflecting the cultural diversity of the shire? Wally: What’s more Australian than snags on a barbecue? You think in China on Chairman bloody Mao Day they serve up pavlova? Marie: (to Chester) Would you like us to do some satay sticks? Robert: We can’t serve satay, there’s the issue of nut allergies. Chester: Why does everyone look at me as soon as we start talking about minorities? No offence, Marie, but you’re the endangered species. Marie: What do you mean? Chester: Well they’re not smuggling boatloads of CWA ladies onto Christmas Island, are they? Helen’s right – the demographic is changing. Wally: And if the demographic doesn’t like a sausage they can piss off home. – Australia Day. Jonathan Biggins. Inspired by his amusing experiences as an Australia Day ambassador in regional communities, Jonathan Biggins uses his satirical comedy Australia Day to throw all the sacred cows on the barbecue, pour lighter fluid over them and burn them with the glee of knowing we’ll smell the acrid smoke, wrinkle our noses and protest, “You can’t DO that!” whilst laughing out loud along with him. Under fire are Australia’s national identity, our small town stereotypes, and their (our) political persuasions. You probably know these folk. You’re probably sitting next to one of them RIGHT NOW. WAIT A MINUTE. YOU’RE ONE OF THEM. SO AM I. This fast paced, clever contemporary comedy is about each of us. It’s about where we’ve come from, where we’re going, and the awkward place we find ourselves in now. Basically, Biggins has put everything on a Bunnings Marquee Folding Trestle Table for our consumption. And it’s not all palatable. The issues here are the nation’s hottest topics – there are plenty of racial slurs, and the typical misogynist, sexist and bigoted comments that induce the kind of laughter we feel terrible about (so should we stop laughing?) – they are all the things “unsaid”, the ugly, undeniable truths of our current cultural and political climate. Australia Day is a raw wry look at our national identity and sadly (and comically) it hits home. Director, Andrea Moor, whom you’ll recall from last year’s (very palatable) Venus in Fur, is a Resident Director at Queensland Theatre Company this year (the other is Jason Klarwein, whom we’ll see on stage in March as Macbeth). It’s terrific timing. Moor has hit her stride in the Playhouse with this production, her first in this space, and she’s always been a bit of an actors’ darling, well respected for her approach to actor training, challenging performers on many levels, letting the story play out between them and inviting us to watch the fun. It’s wonderful to see such consistently strong work recognised and rewarded by our state theatre company. On stage, you’ll recognise some favourite performers and welcome a new one. 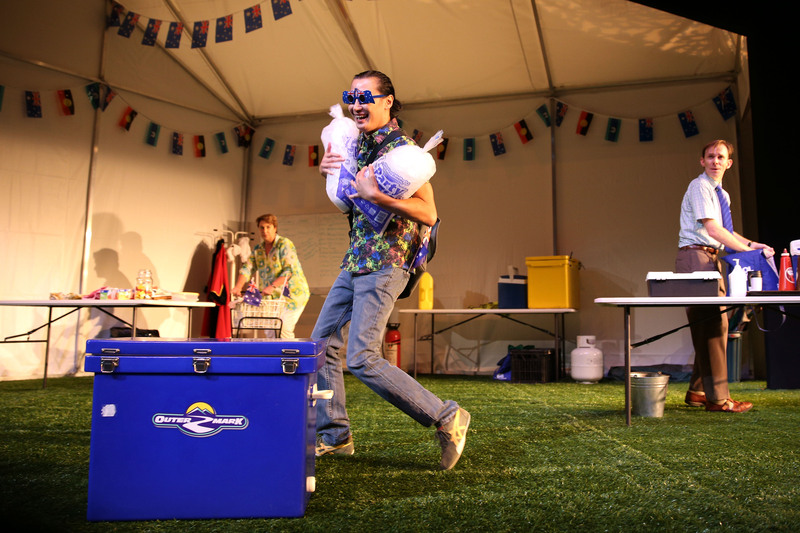 Australia Day marks Lap Phan’s QTC debut as Chester, the Australian born Vietnamese primary school teacher who might just be the most patriotic member of the Coriole Shire’s Australia Day Organising Committee. The other members are your typical small town folk, everybody’s favourite matriarch, the CWA doll, Marie (Barbara Lowing), the racist, misogynist Wally (Chris Betts in his best damaged shocker ocker role yet! ), the super organised and quietly conservative Robert (Bryan Proberts), the Greens candidate single-mum-city-slicker-snake-in-the-grass-newbie, Helen (Louise Brehmer) and the ambitious and slightly misguided mayor of Coriole and real-life Redland City Councillor, Brian (Paul Bishop). With the exception of Lowing, who never fails to give us a Master Class in character (also, connecting voice to character; thank you Paul and Barb for resisting joining the initial shouting match on stage), we don’t see too much of each personal journey, though there are some lovely moments, particularly in the smaller scenes, during which we get a glimpse at the full hearts and the beaten spirits beneath the tough exteriors. I would love to have seen more of Brian – yes, of course, we do get to see Bishop get out of his robe & civvies and get into cricket whites but that’s not what I mean – I expected to get to know him a little more, considering the references to his dubious Internet search history and early innuendo hovering like a heat wave between he and Helen; both utterly delectable threads leading nowhere. There’s not too much an actor can do about that if there’s nothing there to begin with, or to continue with. This is a cast who clearly adores their characters and can offer them up fully, lovingly, and without any judgment whatsoever but even so, for me there seems to be something lacking in the writing, as if the play was penned in a jiffy, in a moment of True Blue inspiration, and unable to wait for each character’s gestation, to grow and become a fully realised human being, because the message just had to be OUT THERE. Generous chunks of the play are devoted to slightly laboured political points that lose out a little to the many witty one liners, astutely observed micro commentary, appropriately placed here, there and everywhere to help drive the pace and encourage us all to “LIGHTEN UP!” The couple of jovial transitions between scenes reinforce this aspect of the message before it’s verbalised, as the cast dances and moves chairs and tables around in a semi-choreographed scene change while we listen to the evolving voicemail messages of the committee, effectively creating something like an ad break each time. 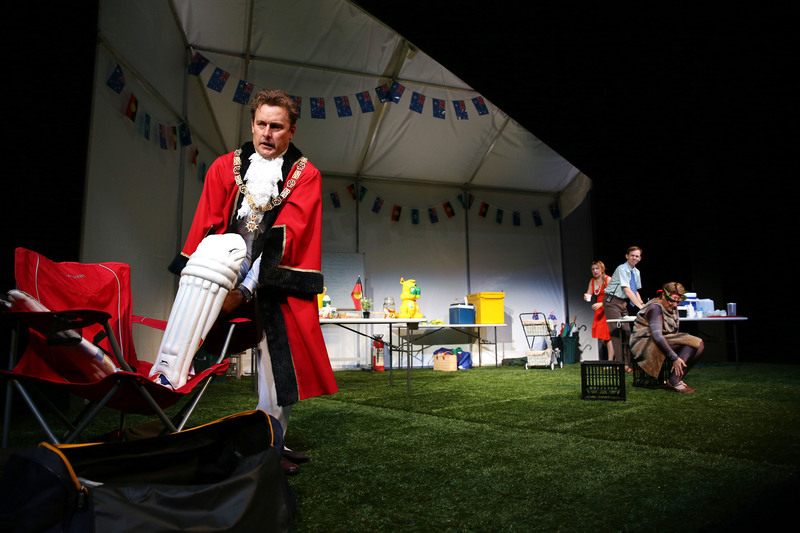 Like Eddie Perfect’s The Beast (MTC 2013), Australia Day is wickedly funny for all the right reasons, and we can’t help but consider which chunks of our short history might help us move forward already. So it’s not that it’s too heavy going or too long (well, perhaps it IS a little too long at two hours), just that it’s so funny because it’s true, and I’d love to walk away thinking not just that I’ve seen the most amusing, most politically incorrect piece since Williamson’s Influence and Perfect’s The Beast, but that I actually know these people, and because I’ve gotten to know them I can feel confident that they – we – can make better choices about the things we say and the things we celebrate in this country. The publicity for this show is bang on. It’s really funny…it just shouldn’t be. A bang-up-to-the-moment barbeque-stopper of a comedy, Australia Day follows a mob of bumbling bureaucratic battlers as they debate the minute details of the national day in the small country town of Coriole. Will their Australia Day be a little ripper, or go off like a bucket of prawns in the sun? 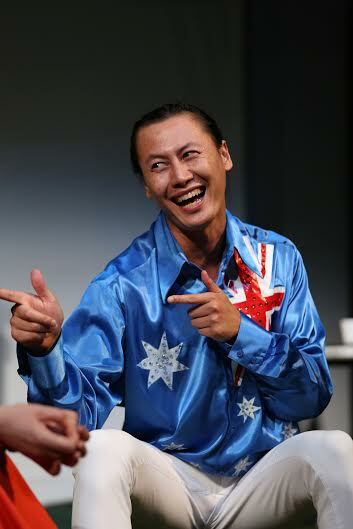 You’ll find out when you see Australia Day and laugh out loud, and be appalled that you did so. Now, throw another sacred cow on the barbie, will ya?